With the accelerating rate of disruption out there these days, it makes you wonder if all of us will be self-employed one day. Access to technology is already empowering many of us to “hang up the shingle” and go into business for ourselves. With the explosion of new service providers, you can outsource almost every business function, and you can quickly become your own CEO. Even though your new company may be spartan with just a few employees if any, you will still be responsible to your customers to get the job done and on time, no matter how much is outsourced. The majority of your team may work for other companies and probably will. But how will you orchestrate all these in-house and outsourced people? How will you hold these folks accountable? How will you know when to hire and how to compensate? What form will your planning take? What will your contracts look like? How about your communications? What about cashflow, personnel, and distribution management? What about decision making? And what about leadership? Is there an easy way to learn and apply the best practices successful CEO’s have been following for decades? And what about the most recent breakthroughs that can help you succeed? How would you like a neat little playbook that outlines and summarizes 70 of the best classic and modern CEO tools, all proven to be successful? Our friend and associate Jim Canfield has just published such a CEO “user’s manual.” We think it should be on the desk of every CEO and every self-employed entrepreneur. It’s called CEO Tools 2.O: A System to Think, Manage, and Lead Like a CEO. 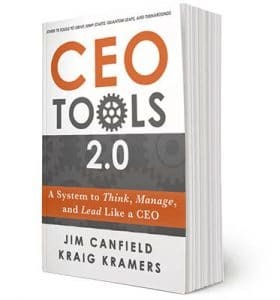 Jim’s new book updates and pays homage to the famous original work, CEO Tools: The Nuts-n-Bolts of Business for Every Manager’s Success by Kraig Kramers published back in 2002. CEO Tools 2.0 is a must have for any CEO, president, business owner, or senior executive who wants to execute easier and have more time – while increasing growth and profits. Sound like you? Set the Direction. Clarify your overall goals, vision, and action plans with a One-Page Business Plan and use it to better communicate your goals to everyone you depend upon. Communicate to Build Trust. Ask everyone you depend on how to solve the challenges you face. They will surprise you with their solutions. Track Metrics and Give Feedback. Identify and track key performance indicators with the Quarterly Priorities Manager (QPM) and the Trailing 12-Month Chart (T12M). Anticipate the Future and Create It. Ensure your company’s future with tools like What’s Next and the 7 Key plans every business should have in place. Attract, Hire, and Coach Winners. Put winners in the top 5 customer impacting jobs and make sure they agree on what constitutes excellent performance. Then empower them. Build an Autonomous Company. Be free of day-to-day involvement with leaders who focus on long-term strategic issues and confidently keep daily issues on track. CEO Tools 2.0 builds out each step with tools you can use and real case studies showing where and how they have been used effectively. Whether you have a big staff or work with an outsourced team, it’s teamwork that will increase your growth and profits, ease your execution, and save you time. CEO Tools 2.0 is the playbook for winning teams!